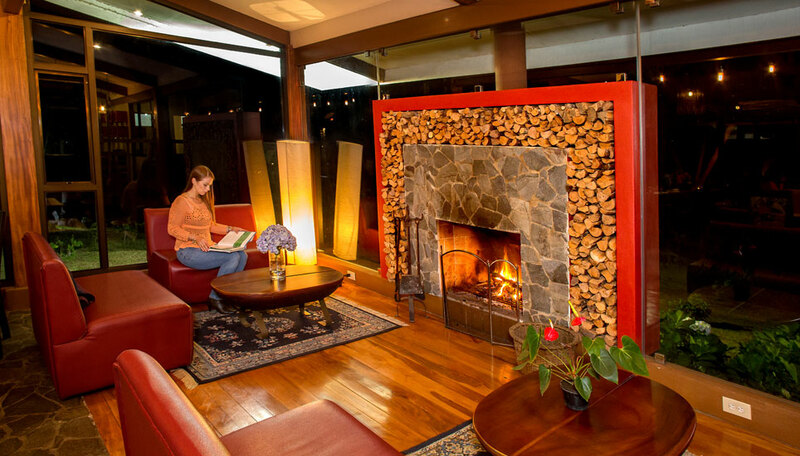 A beautiful boutique lodge in the midst of the cloudforest. Chayote Lodge is open year round. Inspired by the rich coffee culture of the region, each nook of the property has been carefully thought out. 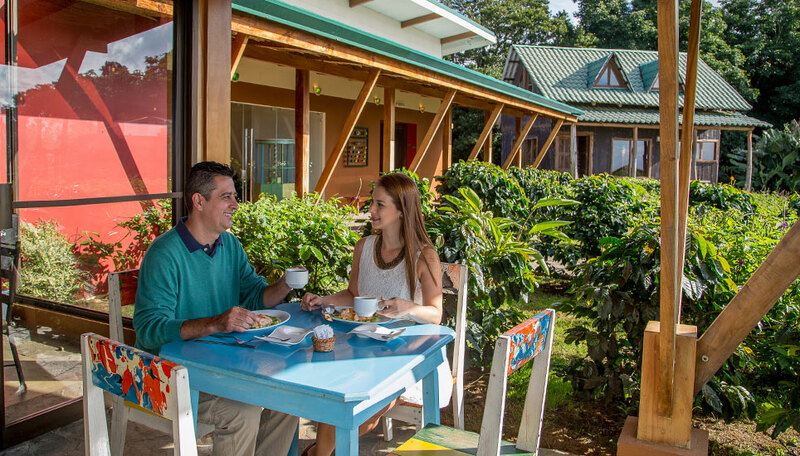 The bungalows resemble the traditional Coffee Receiving Stations known locally as “Recibidores”. They are bright and airy, with contemporary modern décor, and the floor to ceiling windows allow you to enjoy the fantastic views over the valley. The main building of the lodge houses a fusion cuisine restaurant, mixing local flavours with international dishes, a terrace café and a friendly bar where guests have the opportunity to mix with locals, chat and learn about their lives and traditions. Each day, the experience of Chayote Lodge starts as the sun rises in the east, progresses across the sky during the day and finally settles with a beautiful sunset over the Pacific before it all starts again the next morning. Why go to Chayote Lodge ? If you travel to learn about a country’s culture, history, natural wonders, to see how locals live and enjoy a cup of coffee in a stranger’s home, to walk into the markets and talk to the locals, then Chayote Lodge is right for you. If you travel abroad to have different experiences from home, then Chayote Lodge is right for you. If you appreciate small, boutique lodges and a very personalized service then yes, Chayote Lodge is right for you. If you favour local accommodation over international chains and enjoy walking into the local bar and tasting local street food – or at least smell it – then Chayote Lodge is right for you. Chayote Lodge is for people wanting to live a travel experience! In the midst of the cloudforest, the wildlife is fabulous, especially the birds. Hummingbirds such as the tiny volcano hummingbird or the ruby throated hummingbird fly around the gardens regularly. Just sit a while. The resplendent quetzal, toucans, tanagers are among the other 150 bird species also spotted in the area, making this one of the richest for bird watching. Occasionally three-toed sloths and coyotes are spotted in the vicinity too. Don’t for get the frogs, butterflies and other insects! Each room has a king size or two queen size beds, sofa, telephone, safety deposit box, private balcony. Morning breakfast, a guided walk and complementary WiFi are included in your stay. There are 12 suites in total. 11 Recibidor suites and 1 Forest suite. 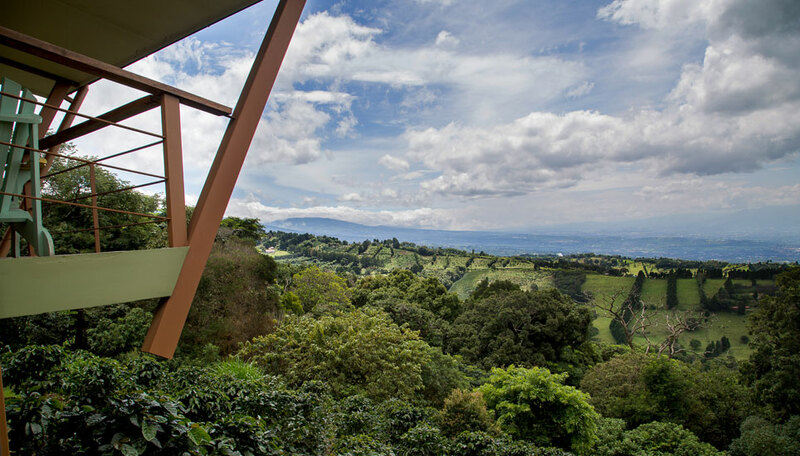 Recibidor Suite: Nestled along a terrace with an impressive view of the Central Valley and the Poás, Barva and Irazú volcanos, coffee fields and pasture lands, each of the Recibidor suites boasts 535 sq feet of space. The suites have been decorated by a local artisan’s exclusive furniture design and inspired by coffee culture and rural lifestyle. 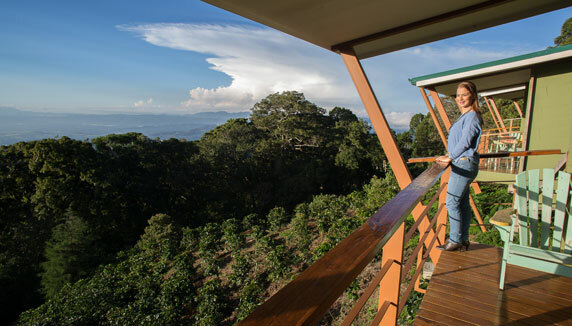 Relax on your modern balcony overlooking a private coffee garden surrounded by cloudforest. 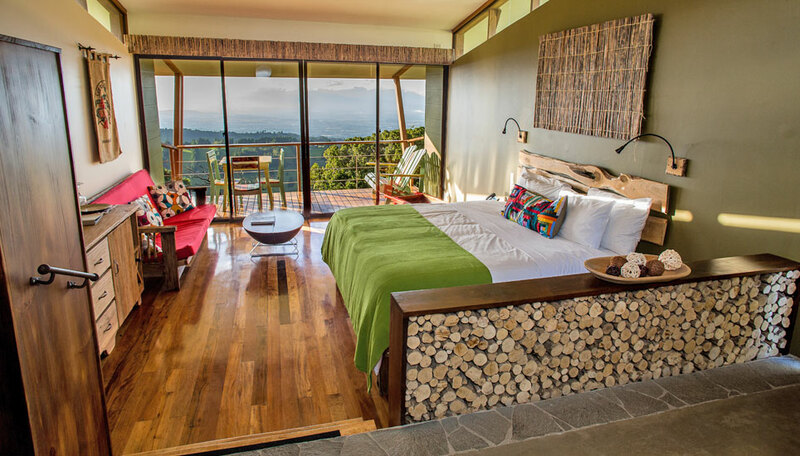 From here the view of the morning sunrise over the Irazú Volcano will let the natural light fill your suite and awaken you to a world of peace and beauty. Forest Suite: Burrowed in the forest and surrounded by the native trees, the Forest Suite boasts 1150 sq feet. If you want to immerse yourself in nature, this is the place to do it. There is ample indoor and outdoor living space, including an exclusive forested backyard and a private suspended deck hovering over the trees. The living room features a fireplace perfect for cooler evenings, and an oversized bathroom area for that extra bit of pamering. Children under 6 stay free. Breakfast is included. Maximum 2 children per room. There is free WiFi in all rooms and also in the main areas of the lodge.